1. What is the difference between whole exome sequencing and targeted region sequencing? In spite of probably the same principle and workflow, whole exome sequencing focuses on exome while targeted region sequencing focuses on any genes that are defined by you. 2. What do I need to submit? The customer who requires the targeted region service need submit the DNA or tissue samples, as well as the list of gene candidates or the chromosomal localization of your target region. We are responsible for the probes generation, target enrichment, library construction, sequencing, and bioinformatics analysis. We accept the following sample types for targeted region sequencing: purified genomic DNA, PCR amplicons, frozen cell pellets, bacterial colonies, FFPE (formalin-fixed, paraffin-embedded) tissue sections, tissues, blood, and swabs. 3. How about the turnaround time? The targeted region sequencing requires custom-made probes, and the custom-made probe need further optimization for an effective enrichment of target regions. It often takes 40 working days to complete the customization of probes and the deep sequencing. But there are commercial solutions for targeted region sequencing, such as the SeqCap EZ Prime Choice Probes, which can eliminate the process of the customization of probes. 4. How to validate variants? Variants identified through the next-generation sequencing (NGS) require further confirmation using either NGS or Sanger sequencing. According to the survey did by Coppieters in September 2014, almost 70% of 178 respondents indicated that they are currently validating their NGS findings using NGS or Sanger sequencing. 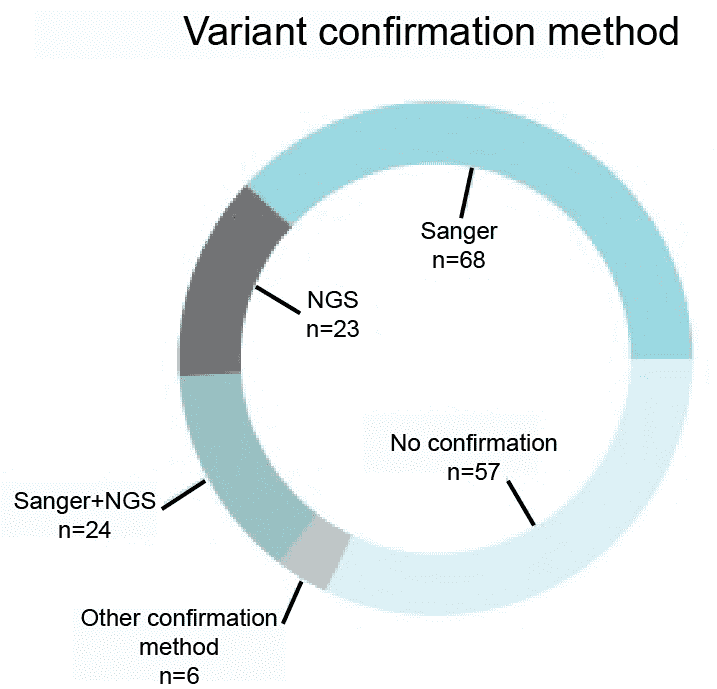 We will validate variants using NGS and Sanger sequencing. Figure 1. A survey of the variant confirmation methods (Coppieters et al. 2016). Coppieters F, Verniers K, De Leeneer K, et al. Targeted resequencing and variant validation using pxlence PCR assays. Biomolecular detection and quantification, 2016, 6: 22-26.